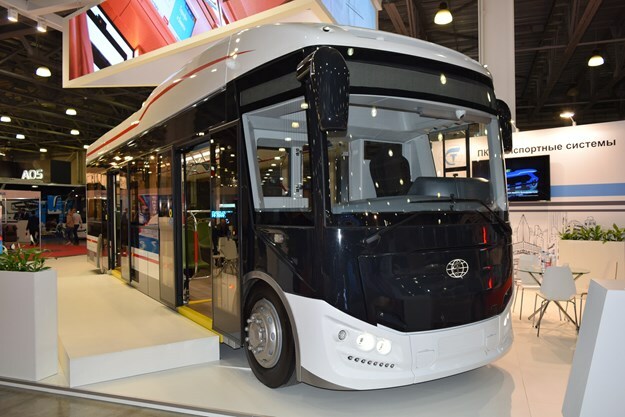 OFFERING AN alternative to – and potentially crushing the aspirations of – various electric vehicle charging infrastructure proponents worldwide, an innovative new Russian-built e-bus can tow its battery storage with it; the idea potentially saving cities globally millions in charging-station set-up costs. 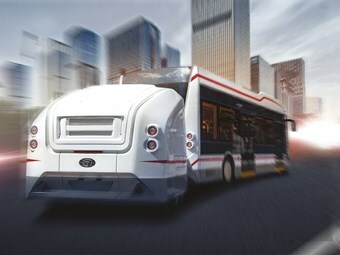 The unique electric bus employs a clever Mobile Battery Storage (MBS) system that makes it possible to increase its driving distance while maintaining maximum passenger capacity, it's claimed. 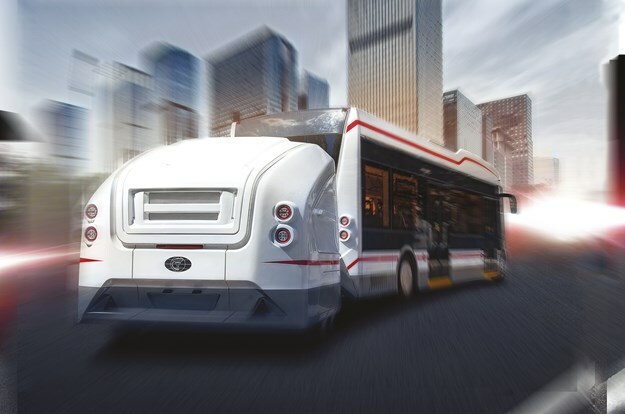 According to the company, the original electric low-floor Pioneer bus is, "…a spacious, eco-friendly, energy-efficient, socially oriented urban transport, capable of transporting both in urban and suburban directions." The NMC trailer-placed batteries have a total capacity of 150kWh, with another 50kWh battery installed on the roof, it states. As the company explains, placing batteries in a trailer, "allows you to operate the electric bus without downtime since the discharged power trailer can be quickly replaced with a previously prepared one with … 100 per cent charge." The total power reserve of 200km is, in rough calculations, greater than the average daily distance of , say, London city buses (based on 2017 quantity data: https://data.london.gov.uk/dataset/number-buses-type-bus-london?resource=12ab947a-6d02-4792-93d1-dac9da2cc7d2, and distance data: https://tfl.gov.uk/corporate/publications-and-reports/buses-performance-data#on-this-page-0), meaning that there is plenty of power available for average usage. For example, in 2017 there were 9,616 buses in London travelling an estimated total of 490.3 million kilometres collectively that year, resulting in each bus covering approximately 139.60km per day. Additional advantages of the MBS are: the absence of the need to modernise the existing power system; the absence of the need to build charging stations; the possibility of subsequent modernisation (if needed) and the possibility of organising "suburban communication". The Pioneer bus is adapted for use in the range of -40 degrees C to +40 degrees C, it’s stated. 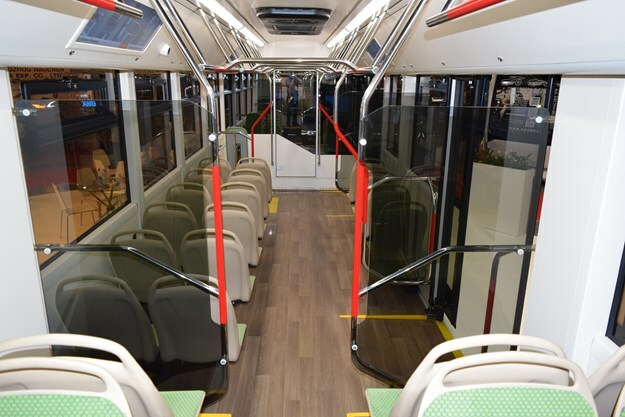 The electric bus itself has a climate system with a ‘heat pump’ and an additional electric heater. The manufacturer refused to use a diesel heater in principle, it says. There are several options for interior layout, with a multi-variant visual design. Highlights include: a lightweight aluminium body (the supporting frame is made of stainless steel) with a passenger compartment ‘wagon’ layout; high comfort and safety of passengers; fully low floor (passenger capacity of 85 people, depending on the layout, and the basic configuration includes 29 seats - one of which is for a passenger with disabilities); plus the mobile battery system instead of the traditional system of fast and slow charging. 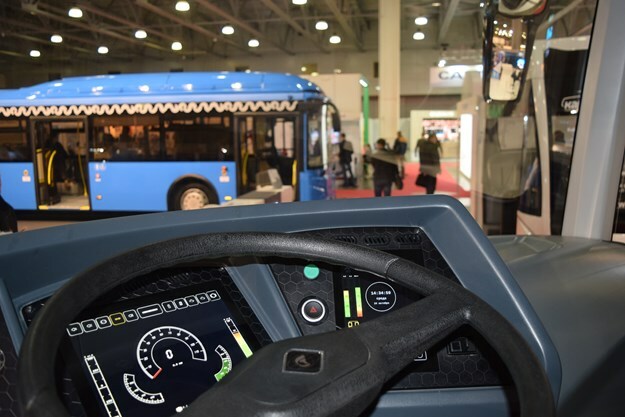 Feliks Vinokur, president of PC Transport Systems said: "The Transport Systems production company is five years old. Well, we are young and make no secret about it. We are ambitious and take pride in that. We are not constrained by stereotypes of previous projects and this is our competitive advantage!" 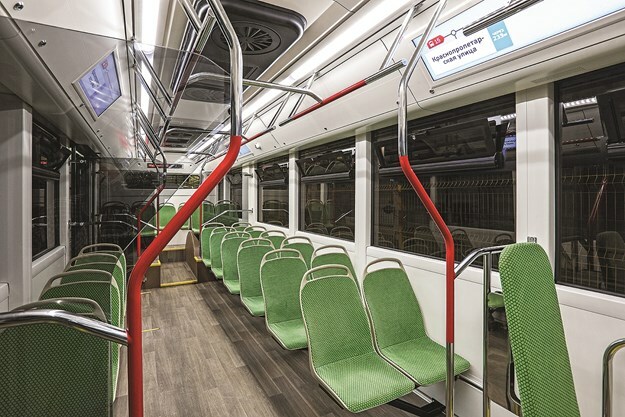 "An innovative, enhanced and up-to-date Pioneer ‘electrobus’ is one of three newly-designed products in 2018. "The Pioneer electrobus is a result of designer, engineering and technical ideas. It is a roomy, environmentally acceptable, energy-saving, socially oriented urban transport. "I am pleased that we are successful in creation of a really good vehicle. I am proud that the best specialists in industry are working in my team. I am happy that our partners from more than 30 cities of Russia and abroad believed in a possibility to realise this desirable and necessary project within the shortest lead time. "We have made it together! And we have made it good! 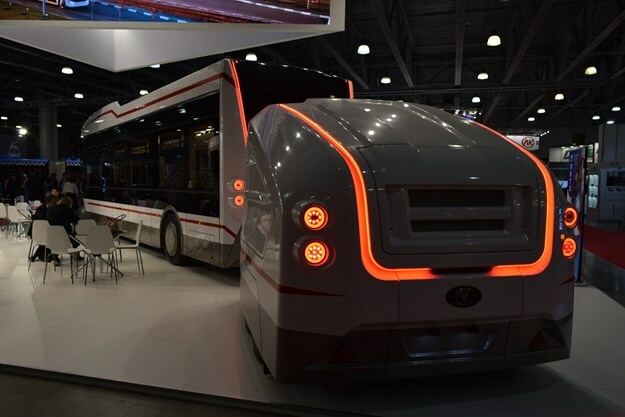 "With respect to each of you…"
PC Transport Systems LLC is a Russian developer and manufacturer of modern innovative urban electric transport, it states. Established in 2013, the company has united the experience and competencies of leading experts and specialists from more than 30 cities in Russia and abroad - professionals in industrial design, engineering, urban car-building and transport electronics, it says. 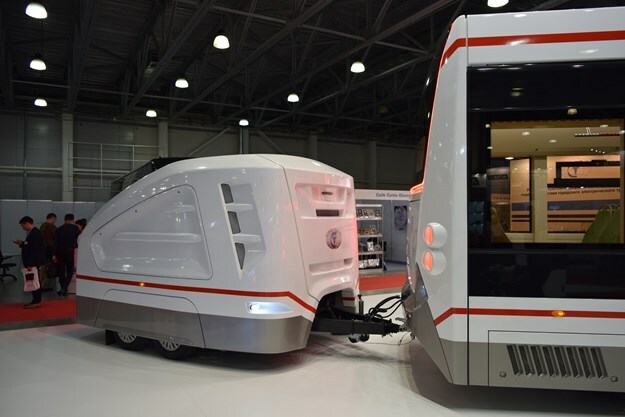 After five years the company has become the leading Russian manufacturer of tram cars, a leader in introducing innovations in urban electric transport, it adds. The company has two production facilities - one in St. Petersburg and the other one in Tver. 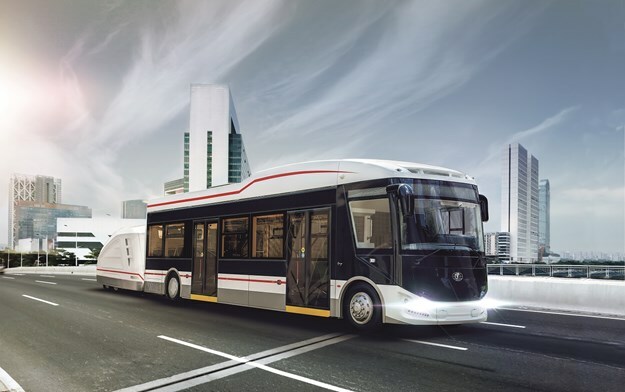 Known for its low-floor trams, the company also produces two rubber-tyred vehicles on electric propulsion: the fully low-floor Admiral trolleybus - with "an increased autonomous drive" - and the innovative fully low-floor electric Pioneer bus - using the Mobile Battery System (MBS). The company’s ideology is to create "…environmentally friendly, friendly, accessible transport of the 21st century. One that meets modern, global trends in the development of public transport and is adapted to the real conditions of operation." 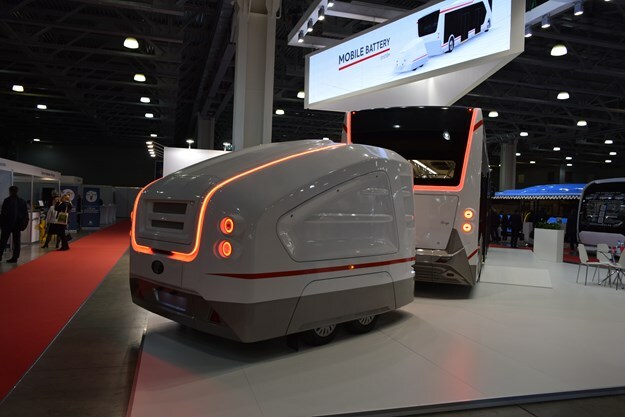 Organised by Autotrans, there was a big increase in patrons to the second held Busworld Russia 2018, in the capital Moscow, recently. The three-day show attracted 5,050 visitors - a 46 per cent increase versus 2016, say organisers – who came from all over Russia and abroad. No fewer than 84 companies from 14 countries exhibited on 9,000m2 - a 90 per cent increase versus the last event. INTERIOR: Seating – 29, Capacity (passenger) – 85; low floor; separate climate control for passenger compartment and driver’s cab.